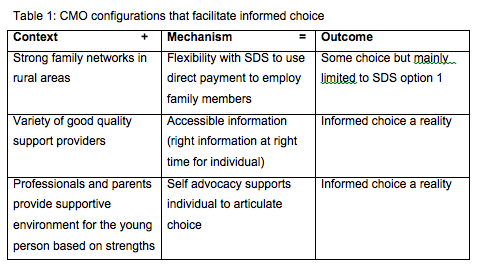 The purpose of this study was to explore the phenomenon of informed choice in relation to the policy of self-directed support for disabled young people in transition from child to adult social care supports and to develop theories and hypotheses in terms of context, mechanism and outcomes configurations that would suggest what works for whom, in which circumstances. The first phase involved the secondary analysis of interviews with six disabled young people and their parents/carers. A thematic analysis approach identified concepts relating to middle-range theories relevant to the first two research questions: which people were involved in informed choice with disabled young people, and what information and support was available to these young people with regard to informed choice? The findings from the secondary analysis suggested that a trusted confidant (mainly mothers) was an important emotional support for disabled young people in making choices. Involvement in choice appeared to be related to the young person’s cognitive and communication abilities with less able individuals being limited to either/or choices related to basic daily living activities. Professionals from the young people and parent interviews, were in the main absent from informing choice or were seen as providing inaccurate or misleading information. However, there were a couple of examples where an individual had a long-standing relationship with a service provider and regarded the staff as trusted providers of information. Analysis of the secondary transcripts revealed the need for the right type of information at the right time for individuals, and the importance placed on visits to a service/resource and lived experience. 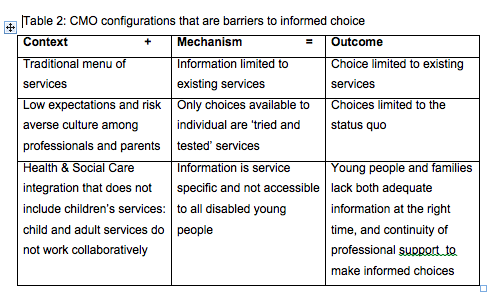 These middle range theories based on concepts identified from the thematic analysis of the secondary data informed the next phase of the research strategy which was to develop more specific hypotheses concerning the third research question: what are the facilitators and barriers to informed choice for disabled young people? The second phase of the study involved semi-structured interviews with eight stakeholders representing the range of interested parties with this policy initiative in Scotland. These interviews followed a realistic evaluation approach to refine and further develop the middle-range theories from phase one in order to come up with more specific hypotheses about what works for whom, in which circumstances in order to explore the facilitators and barriers to informed choice for young disabled people in transition. Table 1 provides examples of the contexts and mechanisms that can make informed choice a reality for disabled young people in transition. Informed choice requires not only accessible information but also individuals being able to express opinions within supportive social networks of parents and professionals. The mechanisms and contexts that get in the way of informed choice include low expectations of parents and professionals regarding young people’s abilities, a bias towards the status quo of supports and services, and organisations that are characterised by bureaucracy and a lack of collaboration especially between child and adult services. The latter finding challenges preconceptions that health and social care integration will lead to a seamless service for the individual, if child and adult services remain organisationally apart and have not developed processes to ensure close collaboration at transitions. However, Mitchell (2012) found that SDS as a policy initiative has the potential to encourage innovation at an individual and organisational level that can result in organisations integrating around the disabled young person in transition. Consideration needs to be given to structural influences on choice, and the concept of ‘bounded agency’ (the interfusion of individual agency and the social environment) may be useful in understanding choice and control (Evans et al, 2001). A critical realist approach recognises that the individual’s capacity for choice making is subject to social constraint and is limited by the power and resources of their ‘stakeholding’. The focus on the benefits of social capital ignores the unequal power held by those in the network, and there is a risk that too much bonding social capital has the potential to lead to conformity, restricting individual freedom. Malecki (2012) points to an ‘innovative milieu’ being more useful for creating change, whereas social capital is more about stabilizing relationships. Social capital seems to have two contradictory roles: the ‘glue’ that binds a network and the ‘lubricant’ that empowers network interaction. The role of social capital as a mechanism impacting on outcomes from self-directed support could be enacted through informed choice. The literature on social capital tends to under emphasise the role of families in constructing social capital and deserves greater examination (Winter, 2000). Strong family networks in rural areas were seen as a solution to the lack of service providers in these localities, but there are dangers that strong bonding social capital in family networks that are deficit focused and risk averse with regard to disability could limit world views and restrict informed choice for disabled young people. One of the strengths of realistic evaluation is that it focuses on generative mechanisms where causation is seen as acting internally as well as externally. This means that the goal of research is not just to study outcomes (effects) but attempts to explain why causal outcomes follow from mechanisms acting in contexts. Therefore social interventions work through the actions of mechanisms (the interplay of resources and reasoning) in a social context (social rules, norms, values and interrelationships). Realistic evaluation is closely related to constructivist grounded theory although there remain significant ontological differences with realistic evaluation attempting to locate phenomena that exist independent of social actors. Realists, while accepting that social contexts differ, nevertheless search for causal regularities and have difficulties accepting the relativism of constructivists. Realistic evaluation has been used in a variety of health and social research settings that are attempting to better understand how initiatives work. However, realistic evaluation has been criticised for neglecting the ‘critical’ element of critical realism and therefore abandonning the critique of power and injustice in favour of technocratic managerialism (Porter & O’Halloran, 2011). My own background as a social work manager perhaps leads me to be more comfortable with such an approach rather than with constructivism or ‘pure’ critical realism. Combining secondary and primary analysis of qualitative data has proven to be a useful approach in terms of exploring the phenomenon of informed choice with a wide range of research subjects. Secondary data was used to discover middle-range theoretical concepts that informed the second phase of the study in terms of the interviews with a range of stakeholders to begin to develop and refine more specific hypotheses regarding contexts, mechanisms and outcomes (i.e. what works for whom in what circumstances?). My approach to the study is best characterised as explorative rather than inductive and involved both inductive and deductive elements in the overall study. Thematic analysis was found to be helpful, especially in the analysis of the secondary data, but a looser approach to coding took place with the primary interview transcripts where the objective was to discover hypotheses based on stakeholder knowledge. Thematic analysis involves searching across a data set to find patterns of meaning. Whilst this is a useful approach to developing broader theories there is a danger that the individual narrative is lost and it is not possible to retain a sense of continuity and contradiction through any one individual account (Braun & Clarke, 2006). Realistic evaluation encourages a ‘teacher-learner’ approach to the realistic interview, where the researcher clearly lays out emerging theories to participants and seeks refinement and new theories from stakeholders. In this approach both researcher and participant are in turn both teachers and learners. This differs from the approach taken by inclusive research with disabled people for example, where the person with the disability is seen to be the ‘expert by experience’ and the researcher a facilitator and recorder of the participant’s lived experience. The teacher-learner function was used in this study to an extent with all participants by sharing emerging theories from the literature and earlier interviews, and to see if these theories were supported, refined or rejected by interviewees. Throughout each interview I learned from the participant’s knowledge and experience, whilst at the same time teaching (sharing knowledge and ideas).